Location: Molompize, in the Cantal departement of France (Auvergne Region). Ownership / Access: Owned by the town of Molompize. 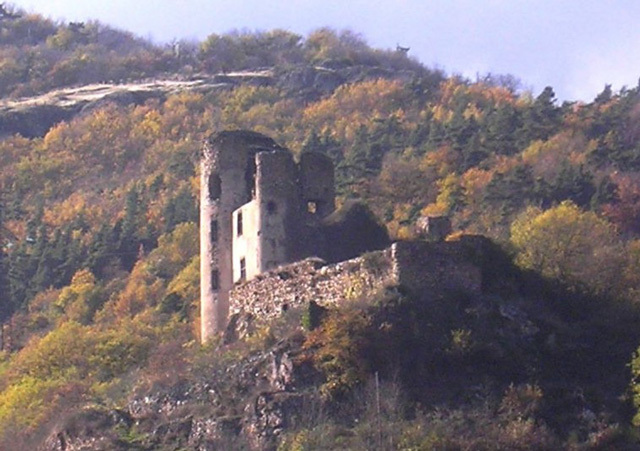 Notes: Château d'Aurouze is a former French fort castle in the Cantal department. It overlooks the village of the same name (common Molompize). Now in ruins, the castle dominates the village of Aurouze. These are the remains of Bertrand construction of Rochefort Aurouze initiated in 1309 with the authorization of Philip the Fair. The facade is slim and pierced with mullioned windows and braces. It is flanked by a tower and a turret. The assembly terminates in a spur terrace. One distinguished there are still fifty years a large room on the ground floor. In it were the helmet with boiled off the arms of Rochefort d'Aurouze "field of mouth, three bars of silver, each charged azure diamonds, three, three and two." To the right were those of Astorg of Orlhac "on a blue field, gold band, accompanied by six silver shells, placed in orle". The coat of arms that Louis de Courcelles quartered with that of Rochefort Aurouze was carved in stone at the keystone: mid-part cut in dexter chief "of the diamonds Aurouze 'in dexter advanced" rockets in fasces "of Courcelles, sinister" shells "of Orlhac".